AFB electric shave brush self-cleaning filter filter (AFB), is of Shanghai long cheng company independent research and development of new high efficient self-cleaning filter, filter element automatically by the mechanical way to remove particles on the surface of the impurities, can filter for online.AFB filters can remove impurities as quickly as possible to remove more impurities efficiently, suitable for filtration of water and various low viscosity liquids.AFB filters follow the standard design and manufacture of long - cheng industrial high performance, high quality and high reliability, and achieve international first-class quality. AFB filters with advanced way of self-cleaning always keep the filter element clean regularly, side by side out of waste liquid containing high concentration of impurities, reduce material waste, filtering with poor water quality of water and low viscosity liquid obvious advantages is more efficient.AFB filter is its significant technical advantage and low running cost, gradually replacing the traditional manual filter in many fields such as bag filter, basket filters, and some of the recoil type filter, etc. The liquid flows from the inlet, the strip-shaped wiper of the spring is attached to the surface of the filter element. The liquid flows through the surface of the filter element through the filter screen, and the impurities are trapped inside the surface, and the liquid flows out of the outlet.As time passes, the impurities gradually increase, the pressure difference rises, and the filter element is cleaned by setting pressure or timing. The motor drives the scraper to do the horizontal rotating motion cleaning the filter element. 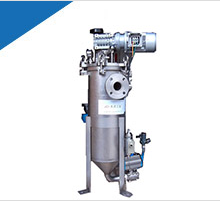 The brush will remove the impurities when the brush is rotated to the bottom of the filter, and the large proportion of impurity deposits to the collector's cavity.Every time the cleaning is made up of several strokes, the filter surface is cleaned and the filtration capacity is restored.When cleaning, normal filtering, flow without interruption. After multiple cleaning cycles, the impurity accumulates to a certain amount, opening the drain valve regularly and discharging waste liquid containing high concentration of impurities, which can be recovered if necessary.